Inspector Morse, an ageing, cultured but cantankerous loner, solves murders with the help of his assistant, Detective Sergeant Lewis. 'Middlebrow' is often used as a derogatory term in British culture, particularly in TV, where it is thought to be a dominant form of expression. Considered to appeal particularly to the suburban middle classes, 'middlebrow' drama is considered safe and sterile. This is often true, but there are undeniable pleasures too and Inspector Morse (ITV, 1987-2000) embodies the best of them. 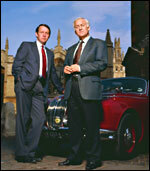 On the surface, the series offers little that is new or challenging; it adopts the familiar patterns of the English 'whodunnit', usually played out against the background of Oxford colleges. However, it proved to be enormously influential in British television (if not entirely to the good) and sometimes succeeded in bringing out the complexities of the human condition. Formally, Inspector Morse set a new mould for TV drama. Each episode ran for 2 hours and the pace was typically languid. The series' success showed that audiences accepted this if the story was involving enough and the surroundings pleasant. Some of the pleasure was in the space and detail given to lingering footage of old buildings, vintage cars and real ale and to the classical music score. No one could accuse the programme of being grittily realistic - Oxford's murder rate rivalled the Bronx; Morse, with his taciturn ways and hatred of computers, would have been pensioned off years ago - but there is a level of emotional realism at work. Much of this rests on John Thaw 's extraordinary central performance, hinting at an unremitting sadness and disappointment at the frailty of human beings, himself above all. However unlikely the murder plots, you can feel the pain of failure every time Thaw is on screen. There is a formulaic edge to the series that veers occasionally to parody - Morse will invariably fall for a female suspect, blush when admitting he has never married and ask her out for dinner at the most inappropriate moment possible, then will wrongly guess the murderer until the downtrodden Lewis puts him right at the last moment - but that ultimately only adds to the enjoyment. The series usually makes the audience comfortable, but surely that has its place in our viewing lives, alongside edgier work. Its exemplary craftsmanship and moral complexity raises it far above the slew of derivative thrillers that followed in its wake. When Morse died of a coronary in the final episode - fittingly alone - it was a genuinely moving TV moment.